Combine offensive and defensive techniques by adding a sturdy sparring shield to your kit. This Polypropylene Copper Eagle Round Shield blends modern technology with classic design to create an attractive and durable training shield. A crown with seven points and a cross is displayed above the central boss, which is decorated with geometric motifs. An eagle flies below the boss, its wings extended upward on either side of the boss. Eight semicircular protrusions form a ring around the central design. The rim of the shield is embellished with small studded protrusions. An adjustable strap and handle on the back side of the shield provide a secure grip and a foam pad insulates your arm against the impact of incoming blows. 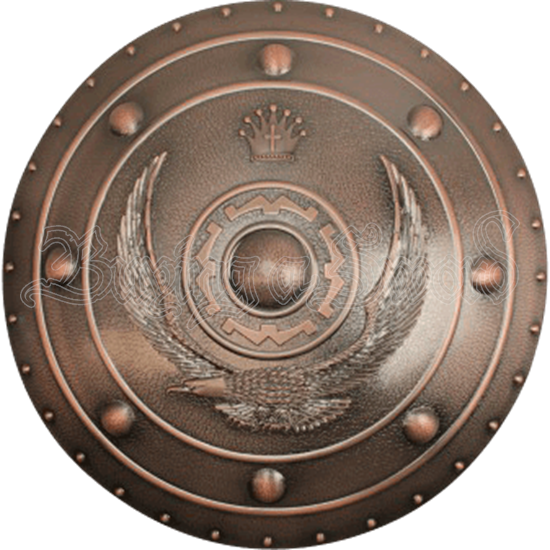 A regal choice for simulated combat, the Polypropylene Copper Eagle Round Shield also makes an exemplary prop for cosplay conventions, Halloween parties, and reenactment events.